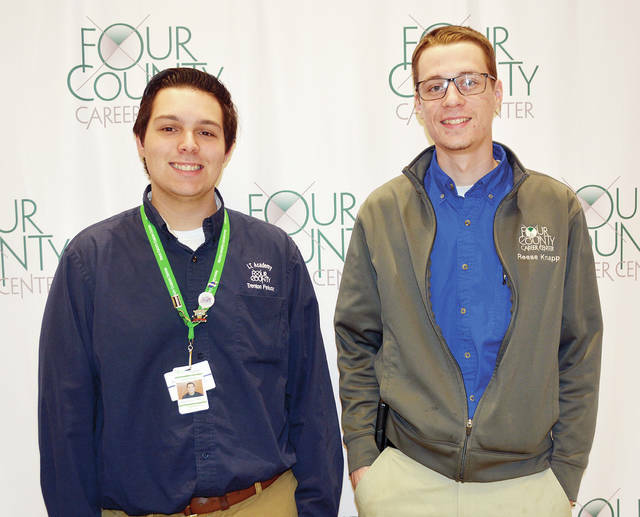 Trenton Peluso, left, of Evergreen schools, and Reese Knapp of Archbold schools, both members of the Four County Career Center Skills USA chapter, will participate in the Ohio State Skills USA Competition in Columbus on April 16-17 after qualifying at the regional competition. Skills USA members from all parts of Ohio will be competing for awards and the right to advance to National Skills and Leadership contests. The FCCC Skills USA advisor is Krista Whetro. https://www.swantonenterprise.com/wp-content/uploads/sites/23/2019/03/web1_2019-skills-regionals-fulton.jpgTrenton Peluso, left, of Evergreen schools, and Reese Knapp of Archbold schools, both members of the Four County Career Center Skills USA chapter, will participate in the Ohio State Skills USA Competition in Columbus on April 16-17 after qualifying at the regional competition. Skills USA members from all parts of Ohio will be competing for awards and the right to advance to National Skills and Leadership contests. The FCCC Skills USA advisor is Krista Whetro.